Verkeersspiegel 60x80cm rand rood/wit. Compleet met alleen klem voor op buispaal met diameter 75 mm. (3 inch) Gewicht 6.93kg. Zichtafstand 15 tot 22 meter. 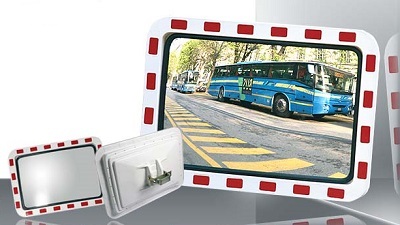 The Traffic mirror is ideal for congested areas like roads, car parks and warehouses. It is available in two different versions according to the degree of high impact resistance desired. The Traffic mirror is made of acrylic, mounted with a black PVC gasket and a white high –impact frame. The frame is with red stripes in order to enhance visibility. Also ideal for areas of vandalism.